SOMERSET, NJ – Takara Belmont released the new Odin backwash unit, which offers new or current salon owners a value-focused equipment solution that brings the comforts of a tilting shampoo bowl, contoured seat cushions, and wide seating space to clients. With up to four inches of high-density foam, the backwash seat has a striking balance of plush comfort and solid support. The ergonomic design of the unit incorporates a curved backrest style and a shallow seat depression of 2.5 degrees to gently support and cradle the customer. The backwash also provides a wide 19.7” arm-to-arm width and a 20 degree tilting white bowl to comfortably accommodate a large range of clients. Available in Grade I & II vinyl or in standard black upholstery with a black body and a white bowl, the Odin backwash unit weighs approximately 88 lbs. with a front-to-back space requirement of at least 102.4” for optimal installation. The backwash dimensions stand in at a space-conscious 23.7” width, 49.6” depth and a variable height range of 36.2-38.6” due to the tilting bowl. The Odin Backwash Unit can be seen at a local Takara Belmont showroom. 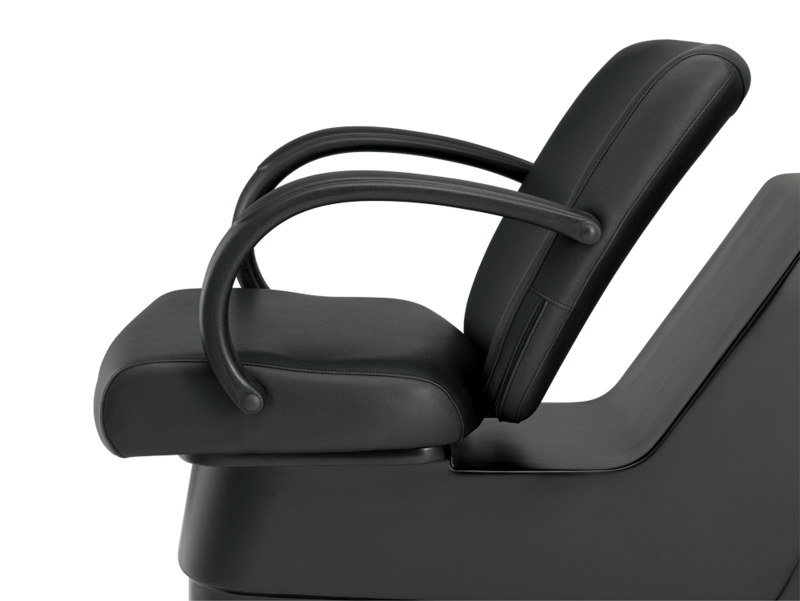 For additional information about the Odin Backwash Unit or Styling Chair, please contact your local sales representative.